We will be closed Easter Sunday. Happy Easter and we'll be back on Monday! In the 1960's four young siblings visit a psychic who tells each of them the day they will die. Would you live your life differently if you knew the date of your death? Would you want to know? Free will or fate? These and other questions are surrounded by beautiful writing that keeps you turning the pages to find their answers. The prophecies inform their next five decades. Golden boy Simon escapes to the West Coast, searching for love in '80s San Francisco; dreamy Klara becomes a Las Vegas magician obsessed with blurring reality and fantasy; eldest son Daniel struggles to maintain security as an army doctor post-9/11; and bookish Varya throws herself into longevity research, where she tests the boundary between science and immortality. 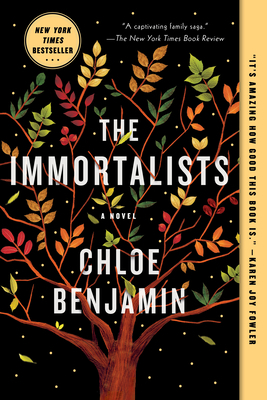 Chloe Benjamin is the author of the New York Times bestseller The Immortalists. Her first novel, The Anatomy of Dreams, received the Edna Ferber Fiction Book Award and was longlisted for the 2014 Center for Fiction First Novel Prize. She is a graduate of Vassar College and the MFA in fiction at the University of Wisconsin. She lives with her husband in Madison, Wisconsin.